HQ Appliance Repair offers high quality service and repairs for all of your Appliance Repair needs. Our goal is to provide you with the best in Appliance service and keep your appliances in full working order no matter what season or time of year. If you are experiencing problems with your Refrigerators, Washers, Dryers, Stoves, Dishwasher, Freezers, Ovens or something else and they’ve broken down on you, call our technician for fast and reliable repairs. Sometimes your Home Appliance breaks or starts to work at the diminished capacity and at this point you have only few options like, buy a new appliance, attempt to fix it or find somebody to fix. Most of the times your appliance needs just a little tune up or maintenance service. So, trying to find somebody that you can rely on is a bit difficult, AND THAT IS WHY. Some companies do not have business integrity and won’t show up for warranty call. 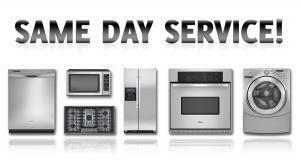 Appliance repair on all major brands and models. Reliable, friendly and knowledgeable appliance repair professionals. We are 5+ rated with the Facebook, Yelp and Google. High-End Appliances – We fix all makes and models including Sub-Zero and other higher end makes. Waived service call when we repair your refrigerator or appliance with no hidden fees.